We have updated the XTDir familiy of extensions. This time we have released a brand new set of features and modules to update the suite. Based on customers request, we have introduced Faceted Search for Joomla, and integrated it with SobiPro catalogs. To put it simply, XTDir for SobiPro provides search features in the same way you can find in Etsy. Futhermore, we have added User Access Level Promotions. 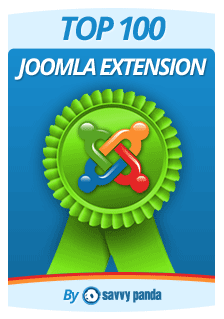 User Groups are used in Joomla for access control to content. Membership management extensions assign user groups according to user memberships. Thus, the new XTDir feature manages SobiPro Entries Promotions (ordering) according to user groups. That is to say, XTDir for SobiPro is even a perfect match for advanced membership implementation based on either on ReadyBytes' PayPlans or Akeeba Subscriptions. To sum up, XTDir v5.4 is a strong release full of news. For more information, please, review the change log. Today, we've released AutoTweetNG and Joocial v7.3.0. On this version, the main feature is a compatibility review for new Facebook Platform Version 2.0. Facebook Platform Version 2.0 has several updates. User IDs and Friends: Graph API v2.0 includes some changes to how user IDs and friends work in order to better protect people's info. Login: Facebook Login in v2.0 contains significant differences as compared with the previous version. It introduces more user permission control, and new and optimized permissions. Graph API: Changes on endpoints and new endpoints. FQL: FQL is still available in version 2.0r, but will not be available in the next version of platform. Sharing: Apps can tag friends as part of that story; App Links is an open, cross platform solution; and more. Biggest impact is on "Joocial - Community Auto Posting" and the audit to authorize Registered User Channels, for more information please, check this slide. Please, remember to upgrade your site to AutoTweetNG or Joocial v7.3. AutoTweet VS Joocial: Which is the best extension? AutoTweetNG is our back-end auto-posting extension and it's going to remain focused to be the best solution available. Joocial is our new extension to solve general social media management in Joomla, front-end AND back-end. Joocial includes AutoTweetNG. AutoTweetNG Architecture is mature, and we release increamental updates following product roadmap (more social networks channels, plugins, powerful auto-posting features, etc). Joocial Architecture, the product has just been released. We plan to implement new innovative features, mainly oriented to the social media team (E.g. marketing agencies managing several accounts). It has its own site: https://www.extly.com/joocial.html, and we have a very busy roadmap ahead. Joocial is not a replacement of AutoTweetNG. Each solution has its own scope. 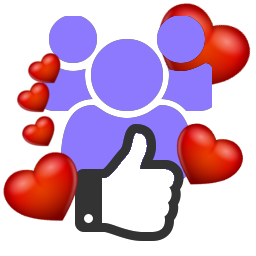 Our marketing-oriented customers have been asking for more social management features. To keep AutoTweetNG neat and simple, we've created Joocial for the new front-end/ back-end usage cases. About Pricing: AutoTweetNG has the same pricing (no change). Joocial has its own pricing strategy, according to the new scope and customers. Extly Club membership pricing has been updated to include also Joocial. Current Extly Club members has Joocial already available. Users! More flexibility, solutions and features are now available supporting new usage cases. If you are happy auto-posting with AutoTweetNG, there's no need to change, we are releasing improvements in every update as usual. If you work in social media management team, and you need to define message scheduling, evergreen posts (re-publishing), content edition, etc; Joocial is the new Joomla solution to help you in content social media management. Please do not hesitate to contact us if you require any further information..
Today, we are also celebrating Joocial first release. Joocial is the next iteration of AutoTweetNG, designed to meet social requirements of all Joomla users (front-end and back-end). Social Publishing Management: New tools to Schedule, and Repeat posts, integrated with Joomla extensions. Virtual Social Media Manager: Virtual assistant to manage when Posts are published, and Evergreen Posts support (re-publishing). Jootool: Front-end team tool to manage content requests and posts. About AutoTweetNG, it remains focused to be the best Joomla back-end social auto-posting extension. Joocial 7 is now feature complete! We are publishing nightly development build release candidates. It's available for download to all Extly Club members. Joocial is our brand new AutoTweetNG version. 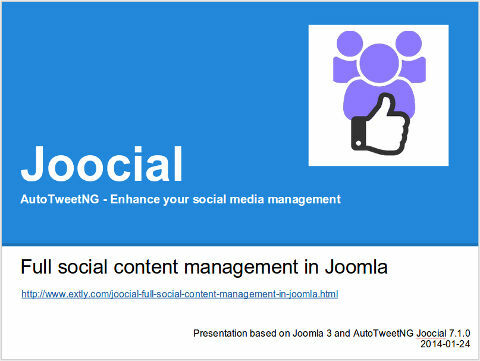 Beyond the original AutoTweetNG scope, Joocial is here to provide full social content management for Joomla. 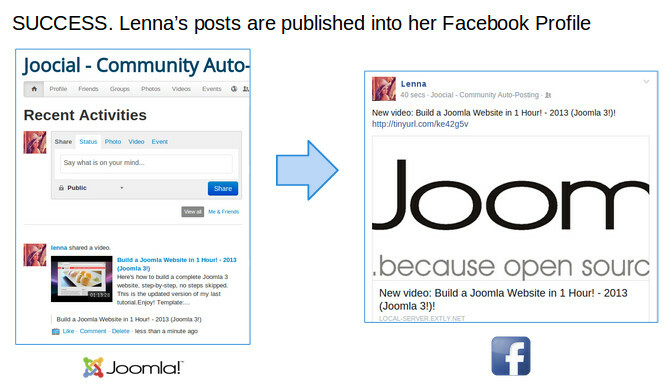 Publishing features to empower social media management for general users in Joomla. Social Publishing Management: New tools to create, edit, schedule, and repeat posts. Jootool - Front-end Social Management Team: Front-end team tool to configure channels, browse, manage content requests and posts. Please, check the new tutorial or let us know if you any feedback. We are counting the days for the final release. Breaking News: AutoTweetNG now supports Google+ Moments!